Back in Feb 2013, Turkish Airlines published an error fare between Warsaw (WAW) and Kuala Lumpur (KUL) via Istanbul (IST). For a short period of time (less than 48h), you could book a roundtrip in business class for just €638. This was ~€2100 cheaper than the regular business class fare. 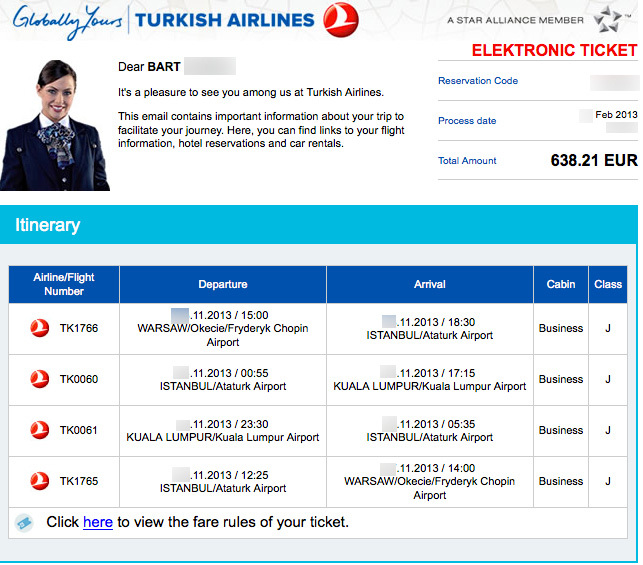 My ticket to Kuala Lumpur for Nov 2013 should have priced €2800 but due to the error I was able to save €2162. 🙂 On top of the cheap fare, I’ll also earn ~18000 status miles with Lufthansa Miles and More. As with most error fares, this one too required a positioning flight. 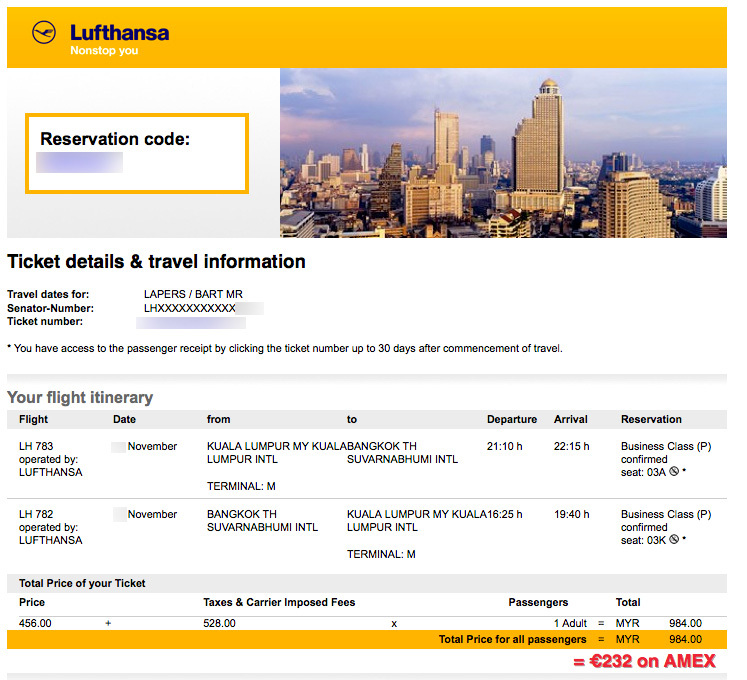 I had to book an additional roundtrip Brussels – Warsaw which was €155 with LOT Polish Airlines in economy class. At the time of booking (Feb 2013), I had no idea which places I was going to visit in South-East Asia in November. I’m quite familiar with Kuala Lumpur, as I’ve been living there from Nov 2007 till June 2008 for a short-term expat assignment. I also recently visited KL on my way to Fiji in Jan 2013. So no stopover in KL this time and straight to one of my favorite countries: Thailand. 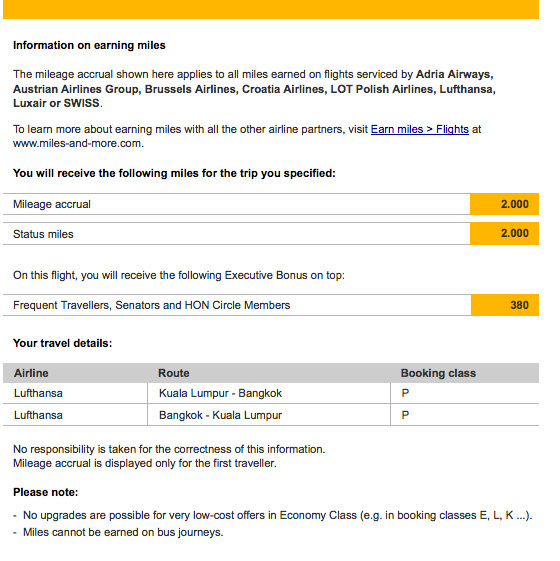 Lufthansa has an A340-600 fifth freedom flight between Kuala Lumpur and Bangkok with cheap business class tickets. I paid €232 for a business class roundtrip KUL-BKK-KUL, which was only €100 more expensive than economy class and will earn me 2380 status miles. After a night of sleep in Bangkok, I’ll continue my journey to a country I haven’t visited before: Laos. I chose Luang Prabang as destination, a UNESCO World Heritage site. Luang Prabang International Airport is served by a handful of airlines which results in high airfares. 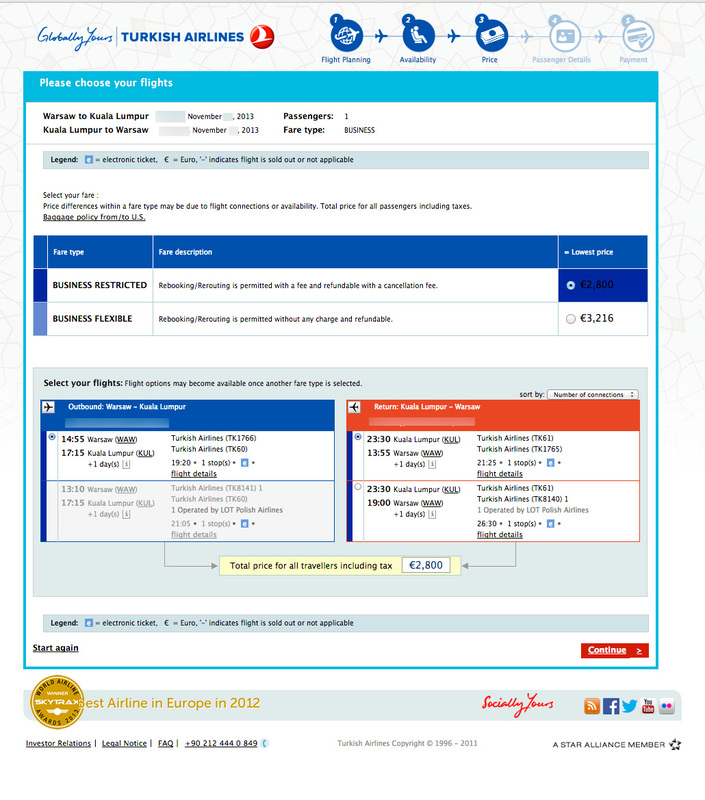 My return trip BKK-LPQ would have been €269 on a revenue ticket with Bangkok Airways. After some research I came across this deal with the Japan Airlines Mileage Bank loyalty program. Only 5000 miles for a round trip Bangkok – Luang Prabang with Bangkok Airways. I didn’t have 5000 JAL Mileage Bank (JMB) miles, so I had to be creative. I read on Ben’s blog the SPG (Starwood Preferred Guest) hotel loyalty program offered 1:1 transfers to JMB. With only 1500 SPG points in my account, I had to buy the remaining 3500 for €90 ($122). The purchased points posted instantly, allowing me to transfer 5000 SPG points to JMB. It took 3 days for the miles to post in my JMB account. I booked the award over the phone and found the agents at JMB very helpful and friendly. 72€ in taxes and fees were added to my award, so I ended up paying €162 (+ 1500 SPG points which I had in my account) instead of €269. Not a huge saving (~€100), but still worth the effort. Pic: Bangkok Airways Cabin Crew – Check the funny safety demonstration video! After my visit to Laos, I’ll head to Phuket for a relaxing vacation at the new Pullman Phuket Arcadia Naithon Beach. My Bangkok (BKK) – Phuket (HKT) roundtrip with Bangkok Airways was €99. Total cost of my 12 flights (incl. 6 business class) = €1286. you’re a wizzard! Have fun! Greg, thanks for the heads-up. I did verify my flights are on TK metal. LH M&M offers 150% of the mileage flown, TK M&S offers 200% (I’m Elite Gold) but I’m not familiar with their award redemption process. Can you give some examples of great value awards at TK M&S? Thanks! Might need to have a second look at TH M&S. I have another CPT-IST-GVA OW TK C error fare coming up in January. I have twice a 6h30 min layover in IST (afternoon and evening). What’s the name of the new arrival lounge? Better than the CIP lounge? how do you get hold of error rates? do you have any alert system/programme/blog? I just keep an eye on Flyertalk and many blogs & twitter accounts. Any reason in particular you’re going for the Pullman in Phuket? Expecting something for that Accor Platinum status? Still can’t decide on a hotel for Khao Lak or Phuket.